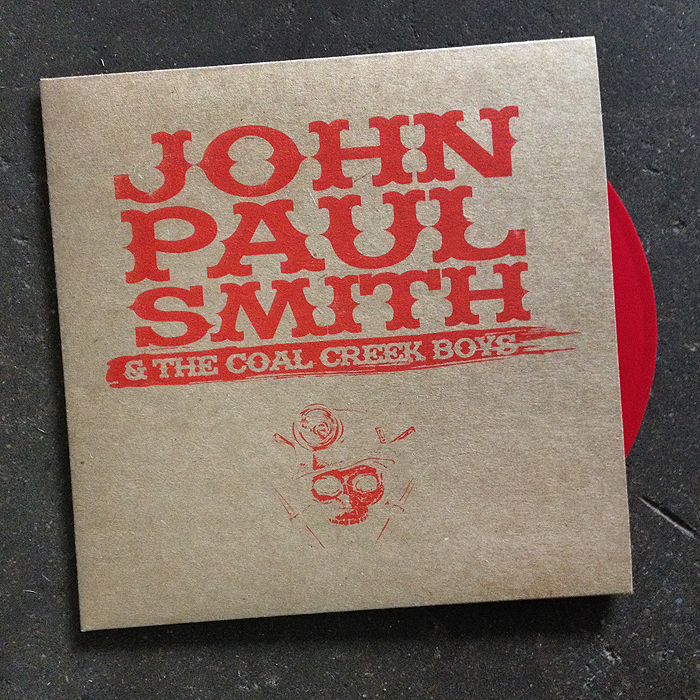 Classic Waxxx Records, Dallas’ new small-batch vinyl record label, is happy to announce it is readying its first vinyl release from John Paul Smith & The Coal Creek Boys, coming Summer 2014. Founded in September 2011 as a vintage vinyl blog, documenting and reviewing classic vinyl records from around the world, Classic Waxxx founder, Jonathon Kimbrell, has since begun to stretch his vinyl blog and obsession to that of a full-on record label, focusing on limited edition reissues of classic blues, rock n’ roll, jazz and country, as well as new music from up and coming artists. 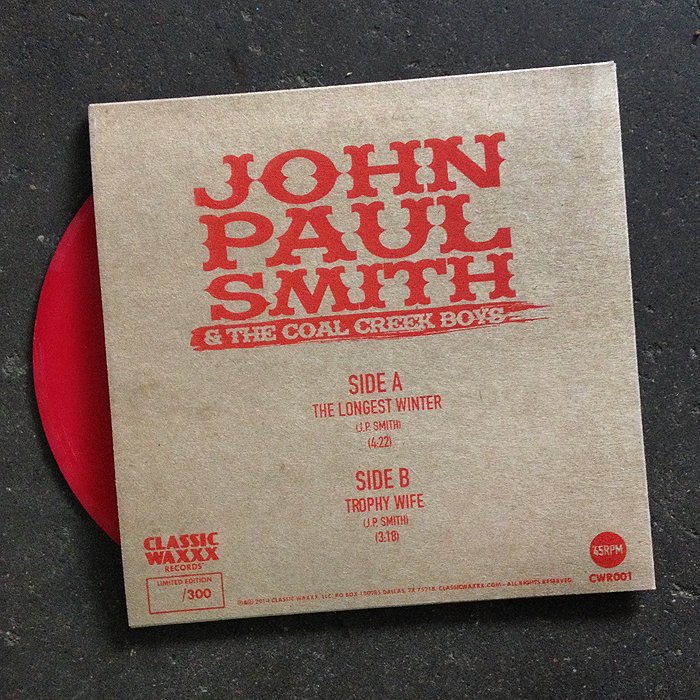 Classic Waxxx Records’ first release is a limited edition 7” record featuring two exclusive, original tracks by Canadian Alt-Country/Outlaw band, John Paul Smith & The Coal Creek Boys. The songs, entitled “The Longest Winter” b/w “Trophy Wife,” featuring recording artist Jillian King on backing vocals, will be pressed on special red vinyl with hand silk screened cover art, limited to 300 numbered copies, and will include an MP3 download card. The band, consisting of guitarist/vocalist John Paul Smith, drummer Dane Alexander, and bassist/multi-instrumentalist Dino Scavo, recorded the songs live in a church built in 1902 in Alberta, not far from the Montana border. Vinyl mastering was completed David Willingham at The Echo Lab in Denton, Texas. Records will be pressed by Dallas’ own A+R Record Manufacturing, owned by Stan Getz II. Foregoing traditional recording contracts with several major labels, The Coal Creek Boys teamed up with Kimbrell’s Classic Waxxx label, due to a mutual love and passion for vinyl records, as well as the belief of providing artists complete creative freedom and control of their work. This single release marks the first of many forthcoming releases on vinyl by The Coal Creek Boys for Classic Waxxx Records, including a tribute to Townes Van Zandt and The Grateful Dead, and the band’s next full-length album, already underway. The single is currently available for pre-order at classicwaxxx.storenvy.com, with a slated release date of on or before September 20, 2014. CLICK HERE TO PURCHASE THE ALBUM!! For more information regarding The Coal Creek Boys, please visit thecoalcreekboys.com. For more information regarding Classic Waxxx Records, please visit classicwaxxxrecords.com. The Unbalanced Note #8 – ‘The Byrds’! This entry was posted on Wednesday, July 16th, 2014 at 12:34 am	and is filed under Music, News. You can follow any responses to this entry through the RSS 2.0 feed. You can skip to the end and leave a response. Pinging is currently not allowed. « You Must Check Out the Documentary, ‘Bottled Up: The Story of Dublin Dr Pepper’! !